Nothing cheers me up during midterms like some miniature bottles of top-notch skin treatments. To be completely honest, that itsy bitsy bottle of AmorePacific Treatment Enzyme Peel is the reason why this holiday gift set made it onto my loves list in the first place. You can read my review of that product here, along with L'Occitane's Almond Shower Oil here. There's an ongoing promotion at Sephora for either 10% off, extra points or some free products by playing the fun matching game linked here. After scoring a 10% off coupon code, I decided to seize the day and order (IMO) Sephora's best skincare box set to date. 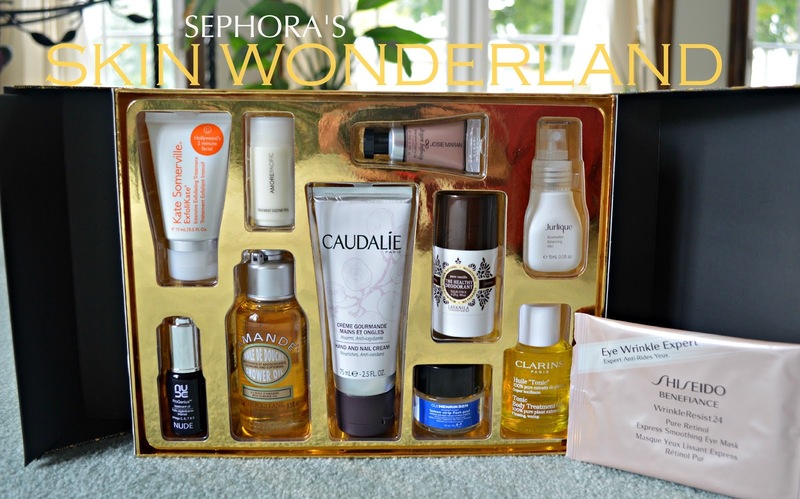 The Skin Wonderland Set is an incredible deal, featuring some deluxe samples and full sized versions of their best-selling skincare products. The 0.5 oz bottle of ExfoliKate is $25 on its own! My new enzyme peel is now in my travel bag, shower oil on the ledge of my tub, and I've begun to test the Lavanilla deodorant. I couldn't be happier with the purchase since I've heard great things about each and every one of these products. The total would definitely add up to $184 if each was purchased individually, so at $70 for the lot, I'd say it's a steal. Although there will be another sale sometime in November (see my Sephora sales list here) I don't know how much longer this set will last. For any skincare lovers out there, take note because this would make a fabulous gift.